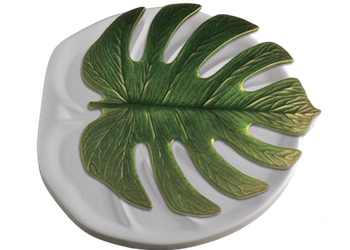 This mold produces highly-detailed leaves that immediately evoke thoughts of tropical rain forests and lush jungles. 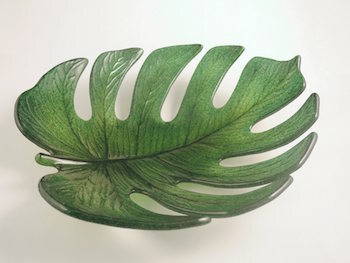 The leaves can be left flat and incorporated into art pieces, or slumped into beautiful bowls. 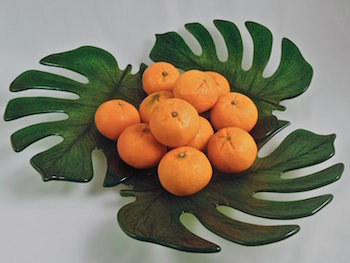 Multiple leaves can be tack fused together and slumped to create impressive gallery quality platters and wall art. Of course, full instructions can be found in our project sheets and videos. Just click on the green LEARN tab above. Finished leaves are 10.5 by 11 inches (27 by 28 cm). 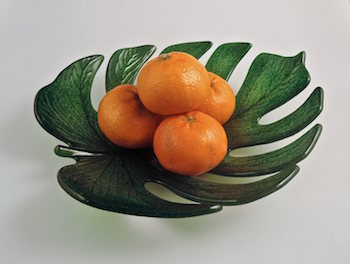 The mold is 12.5 by 13.5 by 1 inches (32 by 34 by 3 cm) and requires 500 grams of frit to fill.